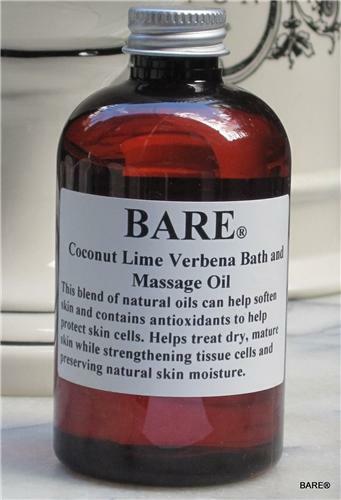 BARE Coconut Lime Verbena* Bath & Body Massage Oil (*Compare our fragrance to Bath & Body Works "Coconut Lime & Verbena". BareBodyCollection LLC and Martha Choy LLC DBA Martha’s Closet are not affiliated or associated with Bath & Body Works, Inc.) This blend of natural oils can help soften skin and contains antioxidants to help protect skin cells. Helps treat dry, mature skin while strengthening tissue cells and preserving natural skin moisture. Non-GMO Soybean Oil, Sunflower Oil, Grapeseed Oil & Rice Bran Oil, Fragrance, Natural Vitamin E.